Search Atlanta Homes - Every home listing from all agents and companies is right here - Always Updated! 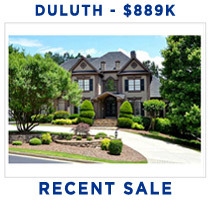 Search Atlanta real estate by price, age, top schools, map, and more. Full Access with No Registration Required! "Just Listed" Atlanta homes - Build an account and automatically get new listings matching your saved searches. The very best homes understandably sell fast when they hit the market. See 'em FIRST - Before They're Gone! 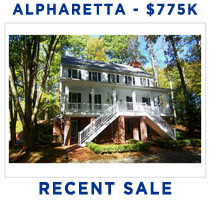 Atlanta Condos & Townhomes - All of Atlanta's "Attached Homes" for sale can be found here. Honesty and Experience are the Most Important Factors when picking your Realtor! Get the Truth when asking which areas and homes are the best for your family. With something of a farm town feel, the heart of Acworth is beautiful Lake Allatoona and Lake Acworth. Great for those who love boating, swimming and fishing. A favorite suburb with active quality lifestyle, top schools, great restaurants, Northpoint Mall, pristine parks, equestrian areas and 10k Big Creek Greenway. In 2009, Forbes ranked Alpharetta as the #1 "Reloville." Commute times are influenced by the fact that there are only three main highways between Atlanta's northern suburbs and downtown: I-75, GA 400, and I-85. Atlanta homes range in age from the 1800s to new, and from modest to luxurious, with executive mansions, equestrian ranches, lakefront homes, high rise condos, penthouses and more. Known for its mansions, townhouses, high rise and penthouse condos, professional and executive living, city life, skyscrapers, great dining, plentiful shopping and fantastic nightlife. Primarily rural, the very southern edge of Cherokee County dips into some of Atlanta's outermost suburban communities and contains 75% of Cherokee's 200,000 residents. Cobb County is often described in two parts. West Cobb (west of I-75) is more spread out with most newer homes found closer to Kennesaw. See "East Cobb" (east of I-75). Located on the west side of beautiful Lake Lanier, much of this area is still being developed. There are many new/newer homes close to GA-400, including country club communities. East side area with modest as well as high end homes available. Great for commutes to downtown, midtown, CDC and Emory. Home to St. Ives and St. Marlo Country Club communities, and the outstanding Sweet Bottom Plantation gated community where each house is an exact replica of a famous Southern historic home. Convenient close-in suburb with most homes built in the 1970s and 1980s. Perimeter Mall and surrounding area abundant with shopping and restaurants. Medical and commercial industries thrive here. East Cobb County (east of I-75) is known for great schools with the majority of homes built by the 1980s or earlier. The few newer homes available will usually start well above $500,000. Emory University sits on a 600-acre campus within the Druid Hills Historic District. This wonderful area is full of life and many of our most talented current and future medical practitioners. Mostly rural, but close-in near GA-400 offers newer development. Good value here, but community conveniences (e.g. nearby grocery stores, shopping, etc.) not fully developed. This is a very large and long county, extending from south of the airport all the way north to and including Alpharetta and Milton. Commuters who need easy access to the east side of Atlanta, or even the Carolinas, often prefer this county and its many great offerings. Previously considered part of Alpharetta, Johns Creek was incorporated in 2008 and has great schools and wonderful communities. Residents often use GA Hwy 141 to commute downtown. Similar feel but slightly lower-priced than Alpharetta, with newer communities, great shopping and chains, Kennesaw State University and right off I-75 corridor. Lake Lanier is the largest lake in Georgia and an extremely popular recreation area with 692 miles of shoreline, 52 parks, 10 campgrounds and 10 marinas. Many here do not regularly commute to downtown Atlanta, while still enjoying the benefits of suburbia with convenient shopping, restaurants and more. Marietta's footprint covers both sides of I-75, but the city is more often spoken of as part of East Cobb County and West Cobb County, both indicated on this map. Exciting and full of life, this area offers terrific communities with wonderful old homes and condos, as well as amazing high rises with breathtaking city views. Adjacent to Alpharetta, Milton was incorporated in 2008 and offers many great communities including some of our most beautiful country clubs and equestrian ranches. A well established area which offers beautiful swim/tennis, golf course and riverfront homes while being a bit closer in for intown commuters. Recently incorporated, the area is very popular and full of activity, shopping, dining and more. Easy access to GA400 and I-285 for commuters. An easy commute to downtown Atlanta, along with Smyrna's own recent village-like updates, have brought new life and new residents to this long-established area. Many accolades have been bestowed upon this wonderful city and residents here speak very highly of the quality of life they experience here. It's hard to imagine a more wonderful intown community than Virginia Highlands, where family and friends walk to shops and enjoy the patio dining and social scene. A rapidly growing distant suburb of Atlanta with a lovely new live/work/play multi-use development that is near completion in Woodstock's downtown. Our Atlanta Real Estate Team is Here to Protect You! Sellers have their listing agents representing them... why wouldn't you want a Buyer's Agent representing you! We consider your lifestyle and commute, the top schools in the area and more to give you the best list of homes to consider. Next, we'll point out the DEFECTS (not just positive attributes) of every home! Fully Informed, you pick the best home for you. AtlantaPros Real Estate Team - Who's running this team? Your listing agent's job is to expose your home to absolutely as many home buyers as possible. Did you know... 93% of homebuyers use the internet in their search? That's more than any other resource? AtlantaPros.com offers tremendous online exposure, because we are so easily found on search engines for searches like "Atlanta real estate", "Atlanta Top Schools" & more.